The patch added by Chris Coulson in the FF 8 packages to add "Ubutnu;" to FireFox's User Agent string has caused some sites to start offering a download of a "application/vnd.wap.xhtml+xml" or similar file. This change seems to have caused an issue with 51degrees.com's .NET Mobile Framework. Visiting a site that uses the framework now prompts to download an "application/vnd.wap.xhtml+xml" file. Obviously, this is likely the fault of the framework, and not Ubuntu. But I felt it should be logged, and I could not find any launchpad bug regarding this change. Sorry, I meant workaround, not solve in the last comment. This is due to bad parsing of the user agent string and can only really be fixed server side. It does not indicate the mime type indicated in this bug. So I am not sure if it is the same bug or a separate bug. According to Question #179908 #13 the problem exists in Firefox 9 beta as well, although no detailed information is provided. I am also having several sites prompting me to download a "application/vnd.wap.xhtml+xml" file for various websites. I also encountered one case in which the page simply renders the page as raw HTML instead of actually rending the page/frames correctly. This behavior is new, and I believe coincides with having upgraded to FF8 (official Ubuntu/Canonical version). and simply create a new user agent -- I called mine "Firefox 8.0" -- and edit out the "Ubuntu; " (notice that the space after the semicolon is removed), that this temporarily fixes the "vnd.wap.xhtml+xml" problem, at least for the 4-5 sites I checked. Note that the User Agent Switcher, when you create a new entry, prompts you with the default user agent string of your version of Firefox. Thus, this is really easy to do -- you do not have to create an entirely new user agent string, simply edit the default as I described. Just for clarity, you (obviously) must switch your user agent to your new agent using Tools -> Default User Agent. Once you change it, the menu also changes (which I think is confusing at first), so in my case the Tools menu changes to Tools -> Firefox 8.0. This did not fix the problem I'm having with one website rendering raw HTML -- the web interface for a D-Link DGS-1210-24 managed switch -- and I have tried using several other user agent strings (i.e., IE6, IE7, etc.) to no avail. So, I suspect this particular problem of mine is related to other changes within FF8 not having to do with the user agent string. 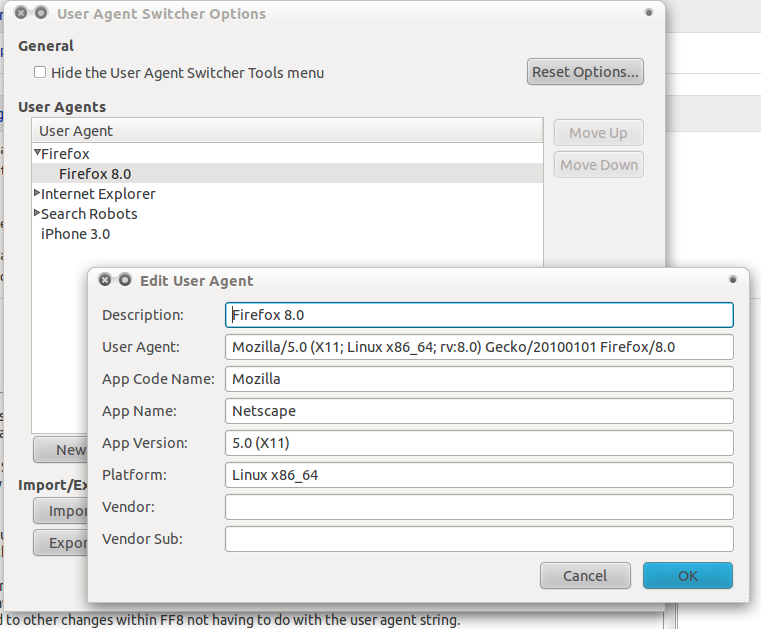 I have attached a screenshot of the relevant settings in my User Agent Switcher. Please file a separate bug for the raw HTML issue. FWIW http://www.bes.pt -> is another website that shows the issue. High profile banking site in Portugal. The work-around for the issue as reported in #3 is not available for FF 8.0 users since the mentioned extension (User Agent Switcher) is not compatible with FF 8.0 and cannot be installed. @Sharif: Did you try to download the plugin directly from the website I mentioned in comment #9? I'm on Ubuntu 11.10 with the very latest official of Firefox (FF 8.0) from Ubuntu and the plugin works just fine for me. See the attached screenshots. Of course, the "Ubuntu; " part of the user agent string is not there, because I'm using user agent to remove it. :) It may be the website has a later version than is available from within FF itself, or perhaps there's something different about the Portuguese version of FF. Hope this helps. Today I just go to the same troubled site and it is opened whitout problems. I've also uploaded this change to the beta PPA for people not running Precise (although it won't be built and published until tomorrow). Did anybody try the beta? Sorry but i'm not sure if i'm doing it! Mozilla Firefox for Ubuntu canonical - 1.0 and it works fine. > Did anybody try the beta? Yes, I'm on the beta now and having Ubuntu *after* X11 solves the issue of being offered a "mobile.aspx" download instead of opening the page on http://www.property24.com/. 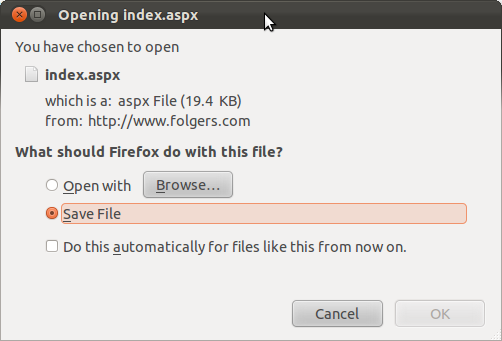 Please path this for firefox9 now !